When you’re planning a move in Stone Mountain, allow Bulldog Movers to help you with everything you need. 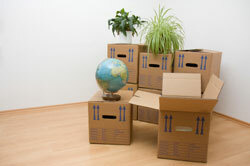 We have a staff of over 100 full-time, professional movers who work solely for us, are highly trained, and do not smoke. On top of that, we have a fleet of nearly 30 bright red, oversized moving trucks outfitted with air-ride suspension, which are larger than standard moving trucks, allowing us to complete moves quicker and in fewer trips. Whether you’re moving closer into town from Stone Mountain, out of the state of Georgia, or even to a different country, Bulldog Movers is here to make your move a breeze. At Bulldog Movers, we strive to be the best possible moving company that we can be. Because of this, we always place down floor, wall, and door protectors to prevent all scuffs, scratches, and other kinds of property damage. We can also build wooden crates to help protect your most delicate and fragile items along the journey from your old home or business to their new destination. With safety precautions like this as part of our standard procedure, it’s no wonder our Stone Mountain local movers have won the Consumers’ Choice Award nine years in a row and have an A+ rating with the Better Business Bureau. To find out more about our Stone Mountain movers and all the storage and relocation services we offer, please call or e-mail Bulldog today.